It was the 32nd consecutive win for coach Mark Reed’s club, which is 10-0 this season and sits atop the Class B North standings. Oceanside fell to 7-3. HERMON, Maine — It was a long evening defensively when the reigning Class B state champion Hermon boys basketball team visited Oceanside of Rockland back on Dec. 21, the shortest day of the year. Only Hermon’s offensive might preserved the team’s undefeated status in that game as the Hawks outscored the Mariners 97-94 in triple overtime. Even in victory, that was an uncharacteristic performance for a Hermon team that had allowed an average of just 40.7 points to every other opponent it faced while winning its first nine games this winter. The Hawks made it look like even more of an aberration during Saturday’s rematch against Oceanside as they limited the Mariners to 14 field goals during a 58-49 victory. “After that game at Oceanside we realized that we didn’t come out and commit to the defensive end as much as we should have. Letting up 94 points is too much no matter who you’re playing,” said Hermon senior point guard Cody Hawes, who led four Hawks’ scorers in double figures with 14 points along with nine assists and five rebounds. Hermon limited Oceanside to 36 percent (14-of-39) shooting from the field and 33 percent (5 of 15) on 3-pointers while inducing 17 turnovers — 16 during the first three quarters — as the Hawks built a 41-29 lead. “Our kids are pretty determined defensively, they take pride in it and the game we played down there I thought just took on a personality of its own unlike any other game we’ve been in,” said Reed. “It was strange, and I think the kids felt like they got away from who they are a little bit. Both squads played this game shorthanded, one accidentally and one inadvertently. Oceanside lost its second-leading scorer, senior guard Trevor Reed, to an apparent right ankle injury late in the first quarter after he had made one of his first two shots, a 3-pointer that constituted 60 percent of the Mariners’ offense in an opening period that ended with Hermon holding a 9-5 lead. Hermon then lost standout junior forward Isaac Varney for an extended period of time after a foul committed along the left baseline by Hawes with 2:03 left in the second quarter was assigned to Varney — his third foul of the game. What the Hawks did in response to that adversity was take control of the game. First, they scored the final seven points of the first half — three after Varney was sidelined — to take a 19-14 halftime lead. 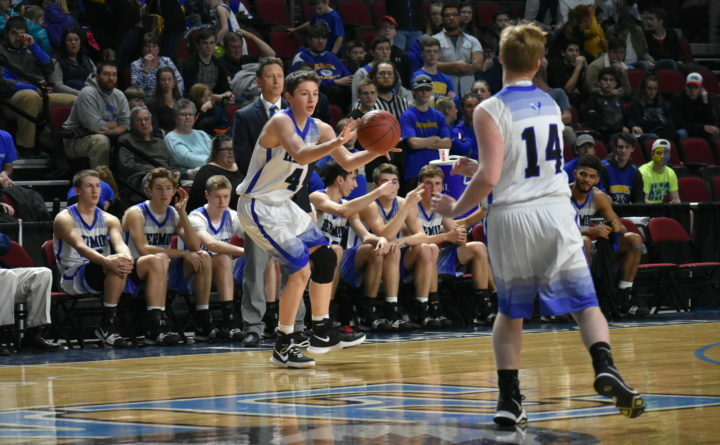 Hermon then outscored Oceanside 22-15 in the third quarter before Varney finally returned to action at the outset of the final period after sitting out 10 minutes, 23 seconds of game time. One key to that surge was sophomore Eli Reed, who came off the bench to contribute eight points, two rebounds, a steal and an assist during the third quarter in Varney’s absence. His two 3-pointers during the first 3:30 of the second half, along with additional threes from Joel Bergeron and Kent Johnson, stretched Hermon’s lead to double digits. The margin grew to as much as 17 when Varney returned to action to feed Hawes for a three-point play and Garrett Trask for a layup to make it 48-31 with 4:51 left in the contest. Eli Reed finished with 13 points while Bergeron and Trask added 10 points each. Oceanside got a game-high 25 points — including 9 of 11 from the foul line in the fourth quarter — from its senior leader, Cooper Wirkala, but Hermon limited the 6-5 guard to 6-of-19 shooting from the field. Senior guard Jack Lombardo added 12 points for the Mariners.